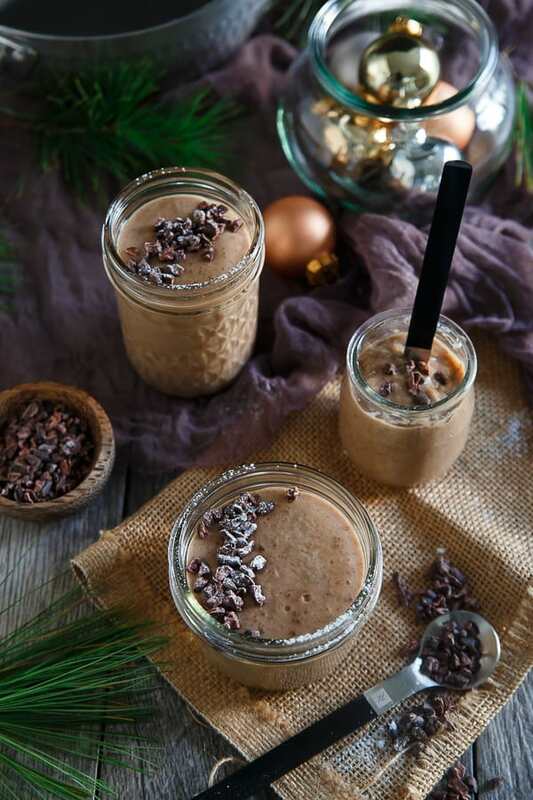 This dairy free gingerbread pudding is made with an almond cashew milk blend for one creamy spoonful filled with all the holiday spices you love. I’m pretty sure it was because of that there was a constant supply of instant jello and pudding in our pantry. Dessert in a pinch for when my whining got to be more than a parent could handle. That said, I never gave a second thought to the fact that pudding could actually be made without some pantry powder packet until many years after what is probably acceptable to have come to that realization (like, um, in my 20s). 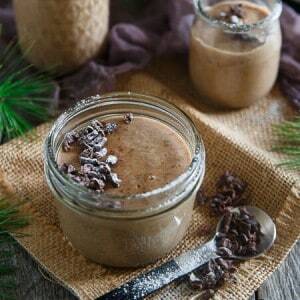 Don’t worry, I’ve since made up for it with recipes like this dirty chai tapioca pudding. I’ve also tried making baked puddings like this coconut caramel coffee pudding which are equally delicious, just a bit more involved. This time, I wanted to make a simple pudding just like the old days with a sauce pot, a bunch of whisking and some simple chill/set time in the fridge. 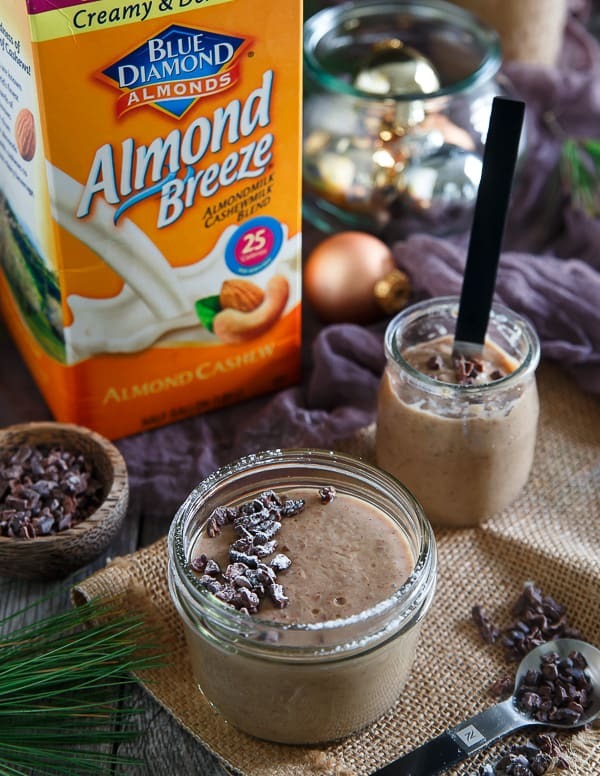 Almond Breeze’s new almond cashew blend that just came out is the perfect way to keep this dairy free gingerbread pudding creamy like you expect from pudding while still a healthy, lower-calorie treat. 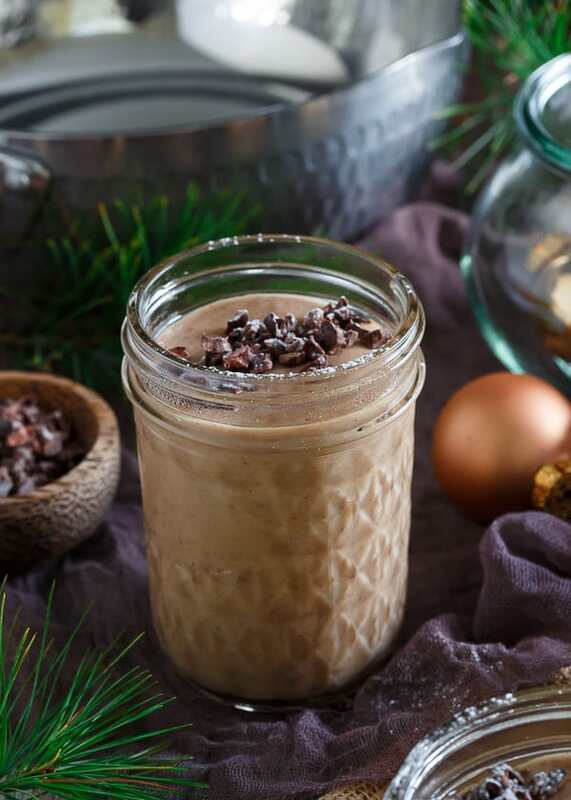 With molasses and all the holiday spices you can think of mixed in, it’s like a spoonful of Christmas with each bite! I’ve definitely made my fair share of those over the years. Hard to beat the quick prep time of chia pudding, it’s such an easy snack or dessert! Place the almondmilk cashewmilk blend, coconut sugar and molasses in a small sauce pot over medium heat and bring to a simmer. Whisk together the egg yolks, tapioca starch, spices and salt in a small bowl. Once simmering, slowly pour one ladle of the hot milk mixture into the bowl with the egg yolks whisking constantly until all the milk is incorporated. Pour the egg yolk/milk mixture back into the sauce pot with the remaining milk and spices and whisk continuously over medium-low heat until thickened. Once thickened, remove from heat and pour into servings jars/glasses/bowls. Let cool to room temperature then cover with plastic wrap and place in the refrigerator for at least 1 hour until chilled. Top with cacao nibs and serve. *This post is sponsored by Almond Breeze Almondmilk. Enter for a chance to win the Ultimate Kitchen Prize Pack, get great savings and ideas for delicious Blendabilities at AlmondBreezeBlendabilities.com. Okay, time to clear out my pantry of those instant puddings … my bad! This looks delicious and the perfect snack or healthier dessert! Almond Breeze is always in my fridge…I haven’t tried the Cashew variety, but I will look for it. Love how you used it here! Oh yummy! I haven’t seen such pudding before. Sounds really great! What a creative take on pudding. I have to try this. I just wrote Almond Breeze on my grocery shopping list! This pudding looks so creamy and delicious! I love the gingerbread flavor and that it’s dairy free! Haha, I’m with you – I totally look forward to desserts before dinner! This pudding looks delicious, Gina! I LOVE all things gingerbread! This pudding looks delightful and I’m so excited it’s dairy free!! Gingerbread pudding is perfect for the season! LOVE all the flavors in this luscious treat! Being lactose intolerant, I’m always looking for a great ideas. This pudding is the perfect holiday dessert. I’ll pretty much take anything with gingerbread in the title. So much yum! My daughter always asks “what’s for dessert tonight” instead of asking what is for dinner! We have to have dessert every night. This is such a great way to use that cashew blend! Wow! Just saw this on FB and had to click through. This looks delicious! !